Our Pre-School is a warm, welcoming place for children to begin their education. Our pre-school pupils thrive on engaging, interactive and enjoyable learning activities at the heart of our well-established 'Outstanding Church of England school'. The children are at the centre of everything we do. We aim to provide the best early years experience within a calm, caring and safe environment, where each child can flourish and learn, ready to take their next step into full time education. We recognise that each child is an individual and has specific needs. Our staff are trained to look after each child's individual care and learning requirements, tailoring activities to their needs. 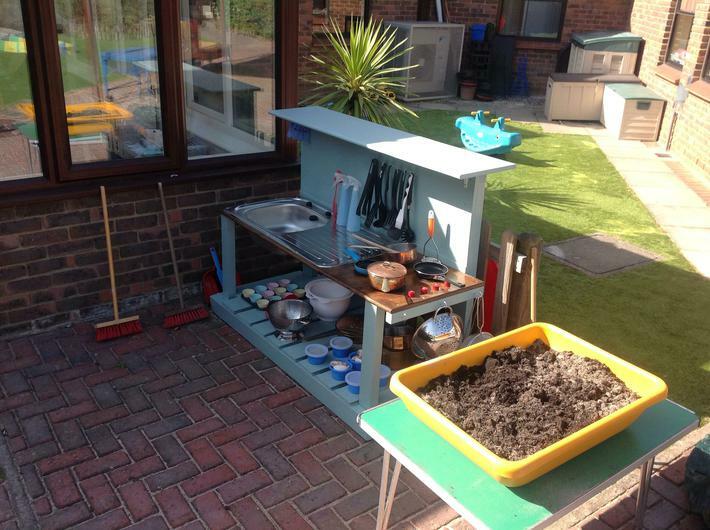 With the recent addition of our wonderful mud kitchen our completely secure and enclosed outdoor area is a wonderful place to be. We have some places available - why not enquire at our school office for a tour of our superb facilities? Pre-School is open every afternoon from 12.30pm until 3.30pm during term time. Please see information and policies under Key information on the school homepage.